Sports, Peace, and the Arrival of the Long Rains! ​The long awaited long rains have finally arrived in Kisumu! The whole city is rejoicing in cooler weather, dust-free roads, and the return of green grass! 1. I’m interested in the potential role of sports as a tool for peace building at the grassroots community level. I’ve been interviewing Akili’s teachers and founders to better understand Obunga’s history, especially the community’s reconciliation process following the 2007-2008 post-election violence. 2. I’m collaborating with students, teachers, and founders to further develop their PE program and launch a soccer team reinforcing their values-based curriculum, offering an avenue for outreach within the greater community. 3. I recently completed a photovoice project with the class 2 and 3 girls, where they walked through Obunga, capturing their visions for peace in their community. The girls then explained their images and we’ll use their input as our launching point for designing the new program. This past weekend found me out and about in Nairobi. I had the opportunity to visit Sunrise (the school I worked with in 2010), and Wow!, I found students and teachers thriving, confident, and proud of their school culture. Bonus: I got to see them compete against other Kitengela schools during their sports day! It was my thesis research in action; full of natural examples of teamwork, leadership, sportsmanship, dedication, persistence, and unity among players. 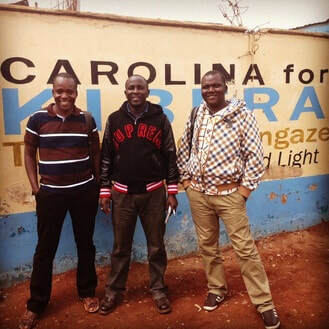 David and Erick joined me in Nariobi for a day in Kibera, one of sub-Saharan Africa’s largest slums. This community is comprised of 13 villages, all of them rich in human potential and innovation. I was so grateful to spend the day with three organizations who are working to champion girls and women through education, sport, and countless other avenues in order to uplift the entire community. ​“There is no such thing as ‘sport for peace’, but there is leadership development and character building and those things in turn create peace.” Our first stop was Carolina for Kibera, where we were so inspired by our conversations with Kennedy Juma, the sports program manager, and founder Salim Mohamed. They were so willing to share their model and offer future networking and support to us. We hope to welcome members of their staff for a “train the trainers” clinic sometime soon. We’d love to have them demonstrate some of their games and activities for Akili’s teachers! We took an extensive tour of three of SHOFCO’s sites (Shining Hope for Communities), but the highlight was seeing the Kibera School for Girls in action and getting to talk with the head teacher about their innovative curriculum delivery and extra-curricular offerings. Just a couple weeks ago in Budondo, I’d read about SHOFCO’s work in A Path Appears (now also a documentary on PBS), and I’d mentioned to David and Erick that we should pay them a visit. Incredible to be there in person and to see another girls’ school thriving while operating in similar conditions to Obunga. Finally, we met with Kibera Girls Soccer Academy, and learned from Clarice just how instrumental sports had been in keeping her focused on her schooling and making it through secondary school. Clarice told us about how sports had opened up a new world for her, allowing her to get to know the villages within Kibera, as well as traveling outside her community. Windows and Doors are on at Akili!